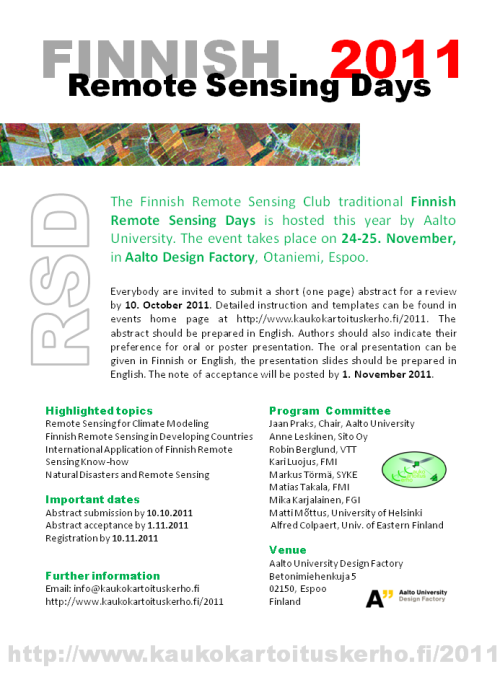 Finnish Remote Sensing Days 2011 are held in November at Aalto University Design Factory! The Finnish Remote Sensing Club organizes every year a national Remote Sensing conference. This year, the occasion is hosted by Aalto University and it will take place on 24-25. November 2011 in Otaniemi, Espoo. The two day's event gives an overview on latest advances in Finnish remote sensing and provides an inspiring environment for professional networking. The conference participation, including a social event, is free of charge! The Finnish Remote Sensing Days is an unique event which brings together Remote Sensing scientists and professionals all over Finland. The conference provides an opportunity to any company to make itself visible to this audience. Fore more details, please contact 2011@kaukokartoituskerho.fi. © Kaukokartoituskerho 2011 / Finnish Remote Sensing Club 2011.